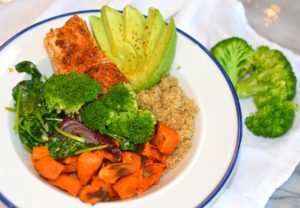 Protein bowls are one of my favorite weeknight meals to make in the beginning of the week. 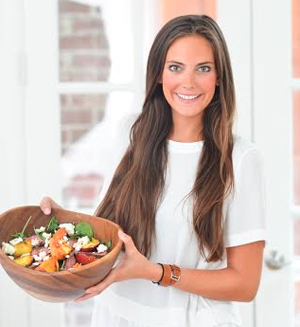 I usually double the recipe so I have all sorts of leftover roasted, steamed and sauteed veggies to snack on or add to new recipes throughout the week for quick dinners. 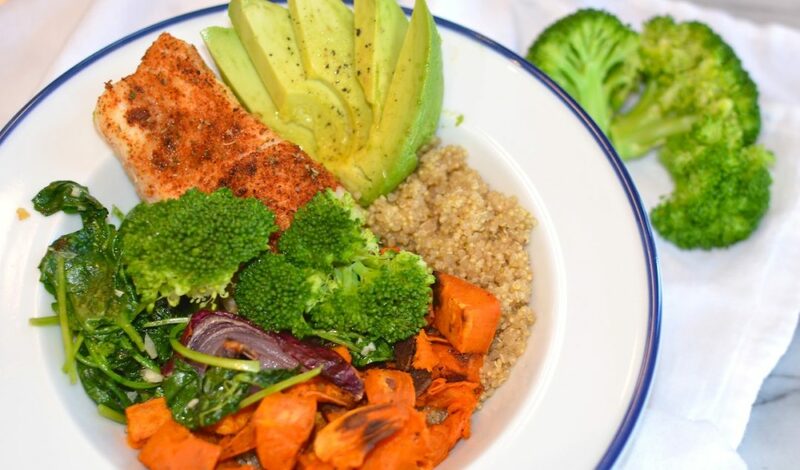 This protein bowl recipe is so versatile so feel free to recreate it with all your favorite ingredients- you could do roasted asparagus, swap out the potatoes, use chicken or steak…poach an egg on top – yum! 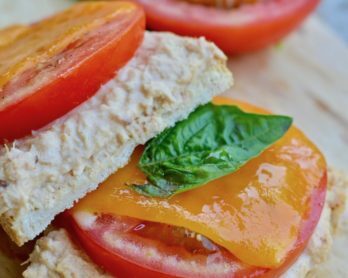 I mean the possibilities are seriously endless with this recipe! 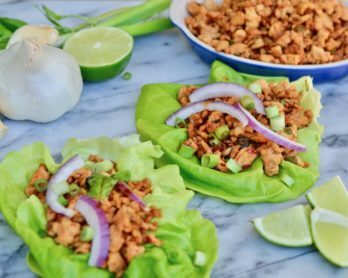 So now it’s your turn- get creative and get cooking! And don’t forget to tag #foodlifelove with all creations- I love to see what you guys come up with! 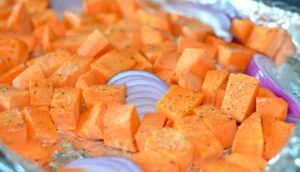 Place the cubed sweet potato and red onion chunks on a baking sheet. Drizzle with avocado oil and sprinkle with salt and pepper. Toss everything to combine. (You can use whatever type of oil you want, avocado oil just has a higher burning temperature.) 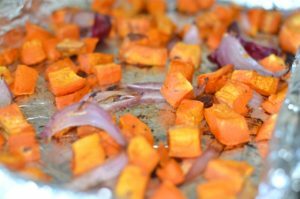 Roast the vegetables for 35-45 minutes or until they are golden with crisp edges and tender on the inside. You want to flip the vegetables half way through. Bring a large pot of water to a boil. Season the water with salt. When the water comes to a boil, drop in the broccoli. Cook the broccoli 3-5 minutes or until tender. It will be bright green when it is ready. When the broccoli is done, put them in an ice bath. 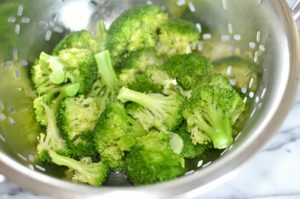 An ice bath is just water and ice in a bowl- this will stop the broccoli from cooking and getting mushy. Set aside. While the vegetables are roasting, pour the quinoa in a small pot. Pour the chicken stock over the quinoa and bring to a boil. Make sure to season the chicken stock with salt and pepper. 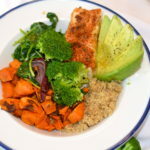 I sometimes add some spices into the quinoa while it is cooking but that is totally up to you! Boil the quinoa for about 15 minutes or until all the liquid has evaporated. Then, turn off the heat and put the lid on. I like to let it steam for 5 minutes before I fluff it with a fork. When the quinoa is done, fluff it up so it can stop cooking. Keep warm in the pot until ready to serve. When the vegetables have 15 minutes left, you are going to roast the fish in the same oven. In a small bowl, mix all the spices together. 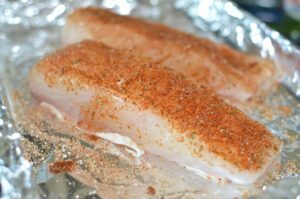 Season the fish with the spice mixture on both sides. Place the fish filets on a baking sheet and roast at the same temperature with the vegetables. The fish should only take 10-15 minutes, depending on how thick your fish is. You do not want to overcook the fish! While the fish is cooking, it is time to sauté the kale. In a skillet, add a teaspoon of oil and bring to medium heat. When the oil is hot, add in the garlic. Cook the garlic for 1-2 minutes, or until fragrant. 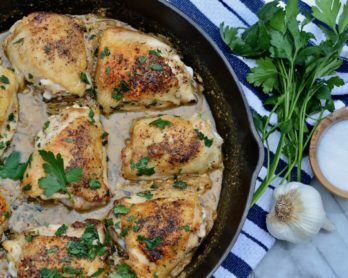 Do not let the garlic turn brown! When the garlic is ready, add in the kale and red pepper flakes. 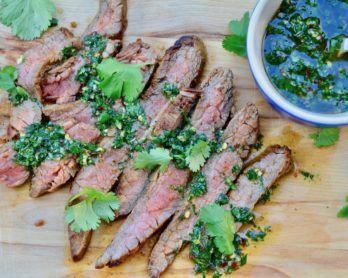 You can turn up the heat and sauté for 2-3 minutes. I do not like soggy kale in this dish, I try to only cook it to the point where it is about to lose its shape and then I turn off the heat. Time to build the bowls: I first put down a layer quinoa. Then in sections, I add on the fish, broccoli, kale, sweet potatoes, onions and avocado. Season the avocado with salt and pepper. I like to top the whole bowl is sriracha but that is totally up to you! Serve warm and enjoy!